Wicked Uncle have taken the stress out of present buying and I have to say, I was really impressed with their website! You can search their website using the child's gender, or their age and there are different catagories such as outdoorsy, spooky & spells and engineer. There is also the option to see whats popular on the website to give you even more ideas on what to buy! We were contacted by Wicked Uncle who asked if we wanted to take on the blogger challenge. We're never ones to turn down new toys so it was a big yes from us, especially Elliot! We had to find a willing friend/relative who needed some help buying toys so we asked my sister Laura to help us out. Laura doesn't have children of her own so she was a perfect candidate to test out the website! "When I got asked to take part in the challenge I looked straight away at what I could buy and was really impressed. 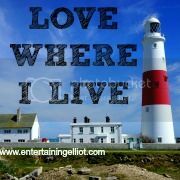 The website was really easy to use with different catagories for age, hobbies etc and I soon found the perfect items to buy. There was such a wide variety of of choices, all at affordable prices and it was very easy to navigate. Check out was straightforward and I liked that you could add gift wrap or a card. The package arrived quickly and was well packaged." So there we go, a big thumbs up from Aunty Laura! So what did she choose? The parcel was delivered to her house (but gifts can also be delivered directly to recipients) and she bought it round to my parents one Sunday afternoon. Elliot was beside himself with excitement and couldn't wait to tear into the box!! Laura chose him My First Microscope and a Live Butterfly Garden - both perfect choices for Elliot! He loves to learn and he's really into nature so both these items were very well received. 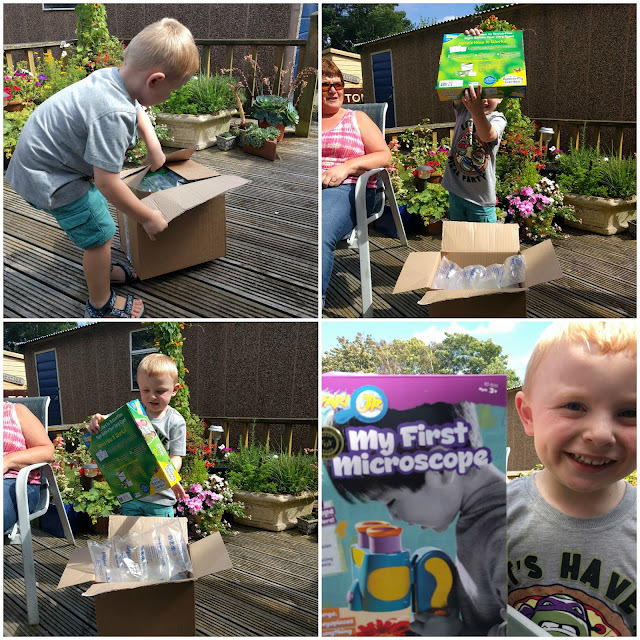 The microscope is really nice and very bright and sturdy, perfect for his age group. He has spent lots of time looking at items under it and most things in his toy box have studied! The butterfly garden is a brilliant gift and perfect for a nature lover like Elliot.The box includes a voucher which is sent off to claim your caterpillars and once they arrive you can watch them grow up to ten times their size before transforming into chrysalides. I like the fact that the butterfly habitat is reusable so you can use it again and again each year. 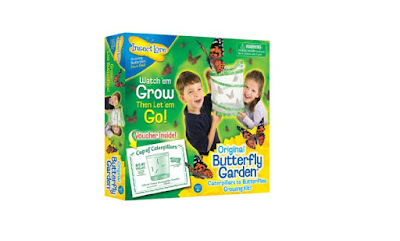 The caterpillars can only be sent off for between March - September so we are going to save this activity for next Spring and Elliot can't wait to grow his own butterflies! We were all really impressed with all that Wicked Uncle had to offer, there is so much choice on the website but it was good to see different items that you wouldn't normally pick for gifts. I will definitely use the website in future for those hard to buy children!